Instead of building secondary walls solely for the purpose of holding fiberglass insulation, an option is to apply rigid insulation directly to foundation walls. This product, which has insulation values ranging from R-4 to R-7 per inch, is made from a variety of plastic materials, including expanded polystyrene, extruded polystyrene, polyurethane, and polyisocyanurate. All of the products come in easy-to-handle sheets and some are designed specifically for insulating foundation walls. Some products (at least one brand of extruded polystyrene) have rabbeted edges that can be held in place with 1x3 wood cleats. Although extruded polystyrene is very resistant to moisture, the foundation walls must be dry before they can be insulated. The following system features extruded polystyrene that is rabbeted on the edges and held in place with wood cleats. The insulation itself is 1-1/2 inches thick and has an R-value of 7.5. Sheets are 2 x 8 feet so the cleats are installed on 24-inch centers. Drywall also is nailed on 2-foot centers instead of the more typical 16-inch centers. Installing them this way works because the drywall is fully supported by cleats and insulation. Check with local code officials, however, to make sure this method is permitted in your area. Measure for the cut and mark it by scoring the insulation lightly with the tip of a nail. 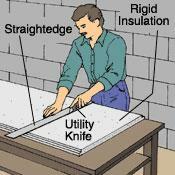 Use a utility knife to cut part way through the sheet; then break the piece off over the edge of a work surface. Use this method to accurately cut each panel. Cut 1x3 wood cleats to the same height as the insulation. Start at one corner of the wall. Hold a sheet of insulation against the wall (trim one edge, if necessary, to fit into an out-of-plumb corner) and plumb it. This first sheet determines how plumb adjacent sheets will be, so make sure it is done correctly. Hold a second sheet against the first and slip a 1x3 wood cleat into the channel between them. Drill three or four pilot holes through the cleat and into the foundation. Pull away the cleat and deepen the holes as needed. Then clear debris from the holes and use concrete screws to secure the cleat. Continue working along the wall in this fashion. Periodically check the insulation for plumb. If small pipes or other obstructions cannot be moved, work around them by placing cleats on either side. Odd-shaped spaces can be filled with expanding spray foam, but it must be a type compatible with the insulation. Continue laying out the sheets; make sure the cleats maintain the 24-inch on-center spacing. Use a table saw to cut jamb extensions from 3/4-inch-thick stock. 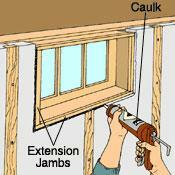 Once the extensions are attached, use latex caulk to seal small gaps where the insulation meets window or door framing. 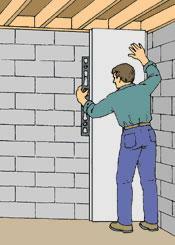 A solid support must be provided for the edge of each drywall sheet, particularly at corners. 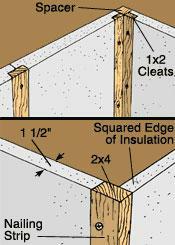 At inside corners, place two cleats edge to edge with a square strip of wood in the corner between them. For outside corners, rip nailing strips to fit the corner. In this case, the strip has to be at least 1-1/2 inches thick and 3 inches wide, so a 2x4 is a good fit. Screw the strip into the corner. When the insulation is in place, the drywall is installed and finished in the usual way, except that the nailing is done on 24-inch centers instead of 16-inch centers. This spacing works because the insulation provides a firm backing for the drywall rather than the partial backing common to a framed wall. Code requires that all rigid insulation facing a living space be covered, usually by drywall. This is because rigid insulation is combustible; leaving it exposed in living areas poses a fire hazard. This method of installing rigid insulation provides the chance to use a greater variety of rigid insulation sheets and allows for a variety of insulation thicknesses. It does not, however, result in an unbroken insulating layer. First, screw or nail 1x2 wood nailers, called furring strips, to the walls. Then fit sheets of 3/4-inch-thick rigid insulation between them and staple a plastic vapor barrier over the assembly. A dab of compatible adhesive caulking holds the sheets in place until the assembly is covered with drywall. Be sure that the foundation walls are free from moisture problems before the insulation is installed. Drywall or 1/4-inch-thick wood paneling (or thicker) can be nailed or screwed directly to the furring strips.